Powers/Abilities: Ripsaw used a suit that not only enabled him to glide securely to the ground from far above the ground, but also gave him the ability to cut through trees, cameras and humans. Two whirling saw blades where attached to a belt and one at each wrist. On each wrist was also a blade thrower which could fire at least a dozen small, round saw blades. Ripsaw spoke Portuguese and English. (NFL SuperPro#7 (fb) - BTS) - Ripsaw was hired by Matias to deal with the Protectors of the Forest and attacks them several times. 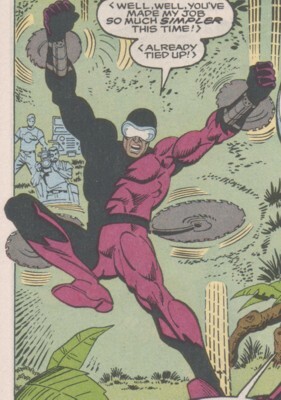 (NFL SuperPro#7) - Ripsaw attacked a group of Protectors of the Forest, who were spiking trees near Amapa. Nine days later back in Macapa he went to his boss Matias, who asked him to increase his attacks on the Protectors of the Forest because they were still slowing down B.L.E. 's logging operations. Ripsaw returned to the rainforest with a dramatic flying entry. He sliced off branches of many trees and the Protectors of the Forest that didn't chain themselves to trees ran away because they were afraid that Ripsaw would kill them. Ripsaw saw Ken Reid, destroyed his camera and threatened to kill him. Meanwhile Claudio Juarez and his friends left in a jeep. Phil Grayfield provoked Ripsaw to get his attention and jumped over him. Ripsaw was happy that he would get a workout, but when Grayfield ran away he thought he abandoned his cameraman Reid. Reid tossed stones at Ripsaw while Grayfield got his SuperPro helmet. With it on he kicked Ripsaw into a tree and the mercenary got stuck in it with his saws. SuperPro got the rest of his armor while Ripsaw freed himself. Ripsaw jumped SuperPro, but the hero was stronger than Ripsaw, who decided to release some blades from his wrist. SuperPro evaded some of them, but one cut through his calf and SuperPro fell to the ground. Ripsaw was ready to finish SuperPro, but Juarez returned with his jeep. Ripsaw was hit by SuperPro and then by the jeep when he landed in front of it. SuperPro then took the weapons of the injured mercenary and destroyed them. (NFL SuperPro#12 (fb) ) - An ambulance and police arrived to arrest Ripsaw and get him to the nearest hospital. Comments: Created by Evan Skolnick (writer), Jose Delbo (pencils), Mike DeCarlo (inks). The suit looks very dangerous for its possessor especially because it wasn't armored. I personally would be afraid to loose my arms and legs while the blades were running. At least he had goggles to protect his eyes from splinters. His nationality wasn't revealed, but I suppose Ripsaw was Brazilian like Matias. Ripsaw's original Portuguese name was never mentioned because all the Portuguese babbling was translated into English, but we know that he didn't call himself Ripsaw because he mentioned to SuperPro that Ripsaw was the English translation of his real alias. Alexandre Juliao Machado sent me the correct Portoguese translation for Ripsaw (the Fish was wrong). Thanks! (NFL SuperPro#7) - Matias was the president of Brazilian Logging Enterprises which had its HQ in Macapa. He liked to bet on soccer games and laugh at normal people's miseries. When the Protectors of the Forest kept slowing down his logging operations he hired Ripsaw to deal with them, but Ripsaw soon was defeated by NFL SuperPro. (NFL SuperPro#12 (fb) ) - After Ripsaw's defeat Matias hired Carlos Carago the Repulsor. Soon after Repulsor was hired he began to attack B.L.E. operations in the rainforest. (NFL SuperPro#12) - Repulsor attacked B.L.E. 's HQ and Matias called his receptionist to learn what was going on. Repulsor broke the door to Matias' office, who realized that Repulsor was not the man he had hired. 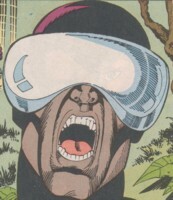 Matias was injured by the new Repulsor and his chance to make a deal with Roxxon was delayed for an unknown amount of time.